Lizzie, Christophe and Diogo all studied at Le Cordon Bleu Paris. 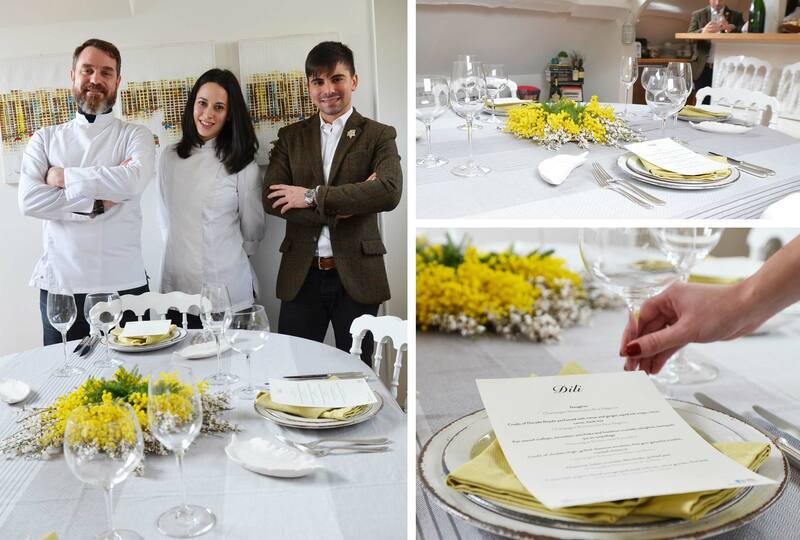 After having embarked on successful careers individually, they decided to pool their skills to launch Dili Gastronomy: a private dining concept in the home which provides customers with a unique experience. What is their strength? Their techniques and skills, honed around the globe, which are applied to French, local and seasonal cuisine. Can you speak about you: where are you from? What Diploma did you make at Le Cordon Bleu Paris institute? D : My name is Diogo, I’m from Brazil, from Rio de Janeiro, I studied Wine and Management at Le Cordon Bleu. I started in 2013 and graduated in 2014. I studied international relations and politics in Rio de Janeiro. I also worked for two years for the British government at the British consulate there. I came to Paris in January 2013 to spend 6 months before moving to London. As I was here I decided to take evening courses in wine tasting just to learn a little bit more about wine. After two months I realized I was falling in love with wine. That is why I decided to state in Paris and join the Wine and Management Programme; become a sommelier and also study gastronomy, the French “art de vivre”. L : My name is Lizzie and I come originally from Hong Kong. I was living in Ireland before I came to Le Cordon Bleu and I was just got a new job, I was working in PR (Public Relations). Myy mother said “what don’t you spend the summer in Paris to learn to cook because it’s something that you love doing." I said “Yeah maybe” and then a week later I was in Paris. It was just completely spontaneous and I was only supposed to come for basic cuisine. “And so half way through the course I suddenly decided, no this is what I’m going to do so I finished the entire Cuisine Diploma. C : Hello, my name is Christophe and I am 45 years old, I began studying the Grand Diplôme at Le Cordon Bleu in June 2012. What I was looking for, following a 20 year career in finance, was a way to open the doors to a profession about which I was passionate, that I truly enjoyed. Le Cordon Bleu seemed to be the establishment which could enable me to begin a new career path. After graduation, I carried out an internship and other boulangerie training programmes. and worked in restaurants. You recently launched your concept every 3, can you tell us more? What are your respective roles? L : So basically Dili Gastronomy is a concept that encompasses high and private dining. In the apartment, we welcome clients who we hope to give a true restaurant experience but with access to those who have compiled and curated the meals, the wines, the products and ingredients. French products used in a more modern and interesting way especially because the three of us come from all over the world. We also bring with us techniques from all over the world that we can embed and use with this great products. D : Dili is all about the experience, we have two chefs, Lizzie specialize in cuisine, Christophe specialize in pastry, myself as a sommelier. There are going to try menus that we change seasonally. There are going to try menus that we change seasonally. We have wines that changed every time, for every diner, wines are pair with each single course. Obviously we talk about the origins of this wine, the appellation, the grapes. There is a lot of history involved here. How did you meet each other? How did your collaboration start? L : The three of us went to Le Cordon Bleu at the same time. Christophe and I met in Le Cordon Bleu when we were in superior cuisine. During this past summer, we decided, sitting in a nice Café at the sun that it would be a great thing to do to build this private dinning concept together, the three of us. When you have really one person of each “sphere” of restauration to cover each area to create a really whole experience for the clients. How do you plan to evolve your business and your collaboration? C : We have just launched the Dili Gastronomy concept in this apartment. We have already had a number of customers and the feedback has been very positive. We would, in a first instance, like to build on this experience, make a name for ourselves and develop our brand. When the business is more established, we would like to extend our activities externally, to develop the consulting side, welcome groups of foreigners who want to have experiences in outside locations, and wine tasting too. D : We have loads of ideas for Dili, we really want to get the brand out there, we want to bring Dili into people’s homes. We, for example, want to organize pop ups, we want to travel, we want to bring Dili to Brazil, to England, to Hong-Kong. We’ve had a few propositions to organize pop-ups and dinners with hotels. How did your internships help you get started in entrepreneurship? L : Le Cordon Bleu cuisine is a great course but it is a stepping stone into the start of a career, in its way to get in the industry especially for foreigners who want to break into the French restaurant industry. The stage is the fundamental part of your training at Le Cordon Bleu actually. It’s the most integral part, without that stage you have no CV, you have no experience to show for yourself, you have no way of knowing how to work in a kitchen team, which is “integral” to work in a restaurant. How do you feel in with that team. Even if you have every single skill in the world, if you can’t work with the people in your team, you will never get anywhere. C : It is the internship which legitimizes the diploma, whether the Cuisine Diploma or the Grand Diplôme. Just having it does not make you a chef or mean that you know how to cook. It is only when you get into the kitchen in an internship, and start working that you will understand and be able to put what you have learnt into practice. D : I chose the Cordon Bleu’s Programme because I knew that it was an important focus on the business side of the wine world as well. As I finished my degree, I knew that I wanted to work independently. C : It’s a combination of histories, of experiences, of different paths. We joined Le Cordon Bleu for multiple reasons. All of that funnelled down into what is Dili today. We hope it will be extremely successful.